Woohoo! My favorite freebie at Quick Chek. Okay anything free is my favorite but the coffee is just extra special. Here is your new Quick Chek Coupon for the week. You can get a Free Medium Coffee . You must like Quick Chek on Facebook to print your coupon. 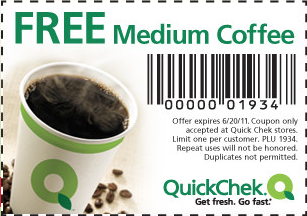 If you are not already a Facebook fan of Quick Chek then just head here to become one and get your coupon. Coupon is good through 6/20/11.